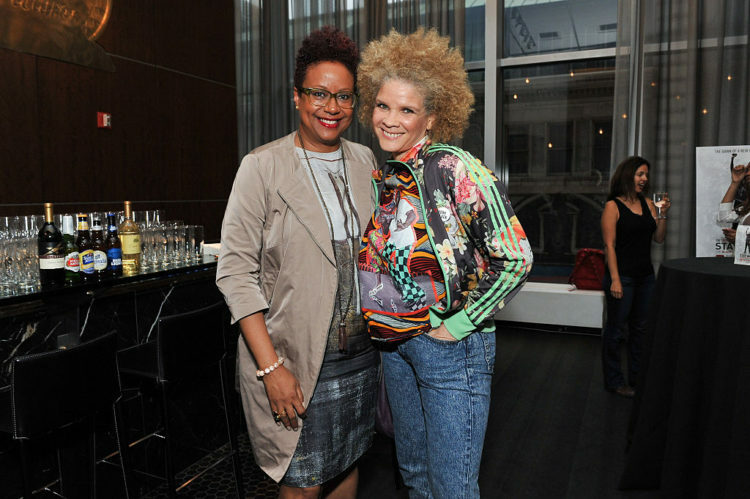 Activist, conversationalist, writer and feminist, BET editorial director, executive fashion, beauty and culture editor of Essence Magazine, CNN correspondent, celebrity stylist… Michaela Angela Davis has almost done it all. Michaela (MAD) has now launched women-empowerment platform, MAD Free focused on liberating conversations about image, beauty and power. It is about 3pm when we meet in front of Mazarine Library in the 6th arrondissement in Paris. She greets me with a wide smile, eyes behind her sunglasses. As we sit at a random brasserie, a connection establishes quite spontaneously, between laughs and hair talk. I’ve been a freelance fashion stylist and worked with major artists. Essence was my first magazine job, where I met Susan Taylor, who was Essence Magazine’s Editor-in-Chief at the time. I was very lucky to work with Seal, Beyoncé and Prince. After Essence, I started with Vibe Magazine as the first fashion director. After a while I did more music. I was very lucky to work with Seal, Beyoncé and Prince. Then my last magazine Honey Magazine, where I was editor-in-chief, was the love of my life because it was for young urban, fashionable women. That was my short magazine career before my activism started with the Take Back the Music campaign, in response to the hyper sexualised images of women in hip hop. I’ve seen many hip-hop figures leave it – like Lauryn Hill, Queen Latifa, Money Love, soon it became, like… I love Lil’ Kim, but it seemed that you had to be Foxy Brown or Lil’ Kim to make it… When Missy (Elliot) came, she was like a genius! So I started writing about the fact that the culture that liberated me literally had betrayed me to the violence of the images. As my activism started, I’ve got much more interested in television and digital industry. What is the The Hair Tales? We ask women to tell us their hair story tale in front of a camera. I’m transcribing their stories into a book, and will add several of my own stories and try to put them together. This project includes everyone: actresses, stylists, artists, teachers, activists… it shows that we’re all connected. So this is how I first started, there is two formats: one is called the Parlour Series, the other one the Kitchen Table. With the idea that there are two places where women talk about bringing out their identities, meaning the beauty parlour and the kitchen table. So the Parlour Series is more formal, that’s where the celebrities, actresses, public figures come out, and it’s more formal in the set-up. 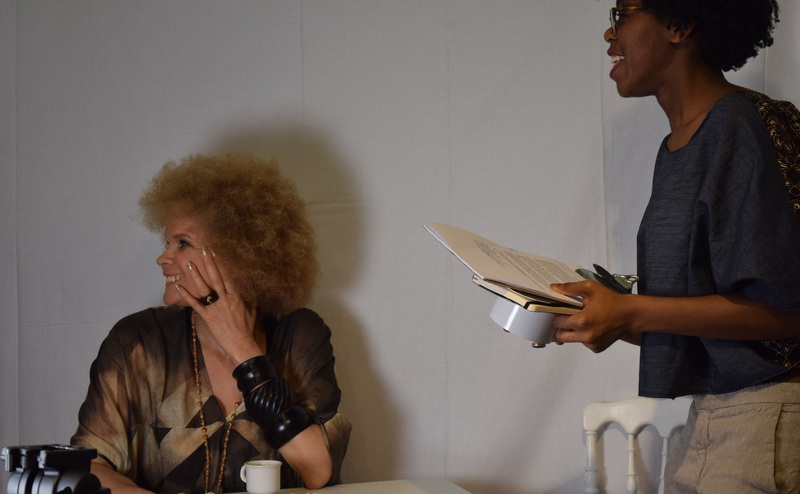 The Kitchen Table is less formal, I bring a table to an event like I did at AFROPUNK Paris, so that I can get all kinds of profiles from the women that come. The idea of the Kitchen Table is that I can take the table anywhere: to a campus; a festival; a gospel show; wherever black women are. I never know who’s coming! Last year, there was this woman, she had these long beautiful thick twists; gorgeous. She’s told me, ‘I’m changing my hair every week, my hair is gone with the chemotherapy. I have cancer’. So I don’t know, I never know who’s coming! Very unexpected! So when I take a table to the people, I want to be surprised. Within the parlour series, I wanted to have a nice cross-section of celebrities, intellectuals and activists, like Patrisse Cullors, the co-founder of the #BlackLivesMatter movement. I also like partnering with people or organisations that have already gathered. It all makes sense, if there are 450,000 black women attending the NHA or Essence festival, why shouldn’t I be there? The book project is growing; the stories are coming out. I am working with a director to see how this can work on a longer-term, and how we could take this to television. I was actually thinking, once the Hair Tales videos will be out, you might turn them into a full-movie project? I do love this idea of many mobile diaries, these many stories that you watch in your hand. I also see these being on paper screens, probably more as a series of the blackness that could be watched on TV. I do want them easy for people to see, ’cause it’s for everybody! When I first did it, it was designed to be on mobile; to be digital on the internet; easy and free. So now I’m working on making partnerships to get it on different platforms. We need to sit down, and you’re going to tell me your story. But I will always need to be on the ground talking to them (interviewees), always! Actually listen, laugh, cry with them… No-one’s going to come and just hand me the essay. No we need to sit down, and you’re going to tell me your story. And when you tell your story you tend to speak in a way that is more honest… We’re all going to do this, face-to-face, and that’s what’s exciting! What motivates your political commitment? A lot. After the massacre in Orlando, this mother went to the club and said ‘I’m looking for my child!’ I mean how do you live after that? These mothers are literally fighting Congress because what’s happening makes no sense! …So you feel it’s the right moment for you to get involved. I can’t live with the alternative knowing that I’ve not tried. But I’m still very much focused on empowering black women. We have the largest group of voters in America. (She nods) We do vote. But we don’t vote enough. With the Obama election, we were all very inspired by the history, we voted for him and for hope. This time we’re going to vote against Trump. So it’s a different motivation… but I like to feel the values of power, justice and equality for blacks in America. This election is critical. I built a platform, I had the privilege of having some mobility, so I have to use it. Have to. It’s smaller than a ‘celebrity’ but it’s something. So what about the next months coming? In July, it’s all gonna be elections probably. But with MAD Free we’re preparing a documentary about Eclipsed, played in Broadway with Lupita (Nyong’o). It’s about the women captured in Liberia during the civil war. The play was written by Danai (Gurira). Danai Gurira is E-VERY-THING!! Have you seen the play? I’ve seen it four times! (laughs) It’s unbelievable, very difficult, so powerful! And it’s the first time it’s ever played in Broadway! With a Liesle Tommy as director and Lala Anthony as the producing partner. 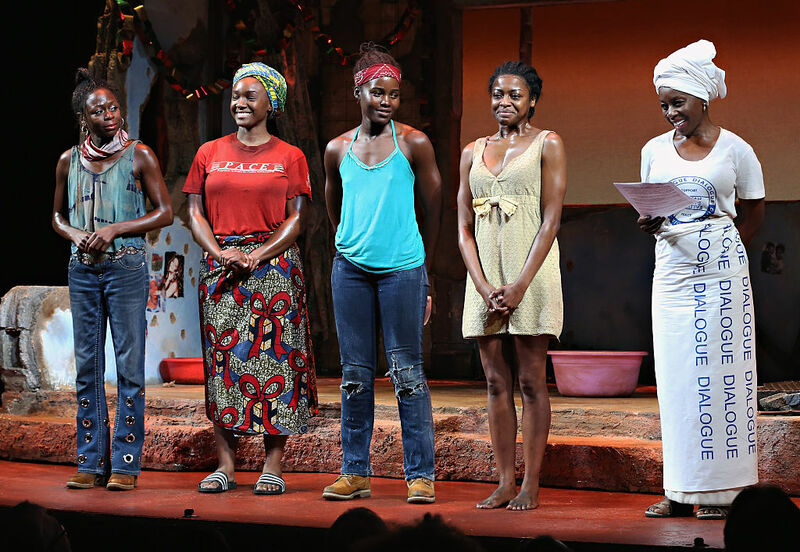 It’s a black woman playwright, a black woman director, all-black women cast, and their diaspora from Kenya, Sierra Leone, Liberia, South Africa and Ghana. Cynthia Erivao also got a Tony for her acting in The Color Purple! I love her. She’s a star in New York! There’s a lot of work being done to elevate and shine the light on the work of black women… that’s what MAD Free is about too. Telling our stories in order to enrich us, through our image of beauty and empowerment. National Democratic Leader Nancy Pelosi joins company of Broadway's "Eclipsed"
In one of your talk shows, you were saying that being both black and blonde used to be a problem for you. Because it was a contradiction. People associated blonde with white but nappy with black (laughs). So I was like ‘What?’ And also I’m so light-skinned… but I have this nose… so it was a trigger thing to people. The blondness triggered the oppression, this blonde was like Barbie! And I had that hair, I mean that colour, but then my texture looks like theirs. And on the other side, blonde means standard, but the texture is unknown, and then how can you be light and considered as black? For the people who didn’t know our history, I was confusing. Both of my parents were light and black. I’m not mixed-race, I mean we’re obviously mixed, but there were always that assumption of: ‘Daddy was black, Mummy was white, Daddy was white, Mummy was black’. But it’s not that simple, both were mixed, very typical in the South, because of migrations during Jim Crow (Jim Crow laws). And the terrorism of that was: if you were dark you were obviously black and you could die! If you were light you were less likely to be killed and more likely to live! So there was a culture of light people marrying each other in order to stay alive. I’m the result of that issue there, and for the people who didn’t know our history, I was confusing. How did you overcome this situation? It was hurtful to black girls too, because the boys thought light girls were cuter. So it was difficult to create friendships. But just in the beginning, it was the first reaction! And that’s why my hair was so powerful. It’s the frontlines of my identity. Who am I? What side am I on? Am I an enemy, am I a friend? I realised very early, that’s how we talk to each other…through our hair. And so I learnt to embrace it. I never liked them straight, I did it once, it was thick, long, moving, it felt like ‘Woooow!! !’, I went insane! I was like five. (laughs) But then it fell out, because of the chemicals. My aunt used a product that smelled like it was gonna melt a truck! Later in high school in the 80s it was all about being individual and different. My hair was indestructible, I got to change their colour, got new waves, then it became everything! And it still is! That’s your very own hair tale! That’s what it was! Like my mother said: ‘There is a story in every curl, coil and kink!’ Every one of them! I believe that people are most beautiful when they’re telling the truth. That’s what I think beauty is to me. Beauty is truth. And I also think beauty is meant to inspire and awaken. My intention is to experience beauty around me all the time, that’s why I love Paris, because it’s fast beauty. I think black women are beautiful, especially when we’re telling the truth together.